I am not a saver. Not really. Our children used to run and hide things when I got into my cleaning mode. My husband has set limits on what I can make disappear while he is gone. As in, his whole garage is off limits. Never mind that I collect a few things myself. I don’t know why since there are countless amazing blogs and chefs and of course internet search engines. I suppose to me, old cookbooks are like treasure troves, where some long lost secret ingredient or combination of ingredients, may lie buried in their yellowing pages. In a weak moment some time back, I hauled a trunk full of books including some cookbooks to the thrift store. I've hardly missed them. Yes, one of those cookbooks was about using dates instead of processed sugar as a sweetener. Sugar has always had a very negative effect on how I feel after eating it. Hopefully we are all more aware than ever that food rich in nutrients and minimally processed is just better. Have you ever used dates in recipes? If not, please don't run off yet. Trust me on this, I'm not one to compromise taste, especially when I'm craving chocolate. And since finding out just how amazing and tasty recipes with dates are, my fears are confirmed. That cookbook I tossed surely had some amazing recipes with ingredient combinations that are now gone forever. Fortunately it has pushed me to try a few things on my own and the outcome has been tasty. Since writing about Table Life and Knowing Your Neighbors, I've been having people drop by to sit at the table! (Squeal!) It's been so much fun. It's also made me realize how I need to do a few things to be prepared, since I love to share food as well as face time. 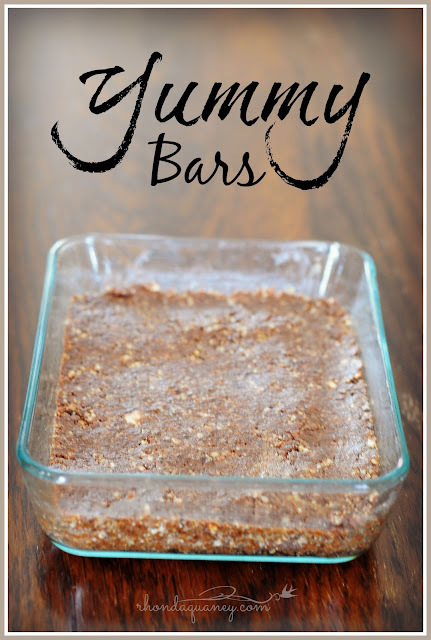 So here is a recipe that is so easy, healthy, no cooking, and best of all.... yummy! They are kind of like fudge. But I make them when I am wanting brownies. There are only four ingredients. And I keep them in the freezer. If I’m craving a treat they are there. If someone drops in they are there. Unless I eat them all. Then I make some more because it really only takes a few minutes. Don't we all need something simple and amazing in our lives? Well, this may be that thing. 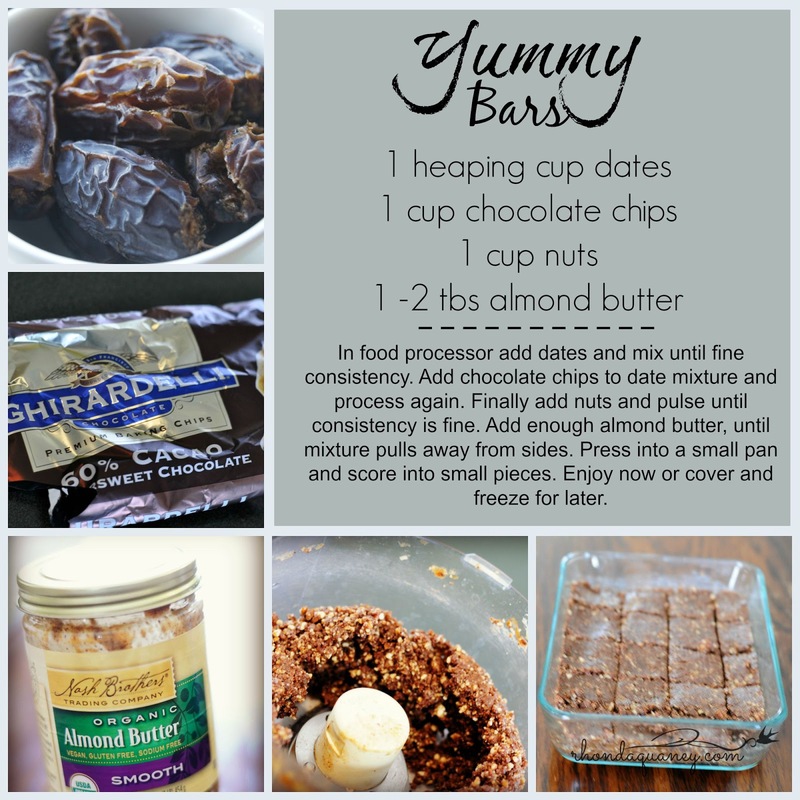 1 cup chocolate chips -I prefer Ghirardelli 60% Cacao baking chips or your choice is fine! 1 cup pitted dates -Start with the ones you can find in the dried fruit section. You may want to get fancy and find Medjool dates known as “King of the Dates.” Trader Joes is my friend for this. The dates should be moist. If they feel a little hard just soak them in warm water for a few minutes. In food processor add dates and mix until fine consistency. Add chocolate chips to date mixture and process again until well blended. Add nuts and pulse until all ingredients are blended. Finally add almond butter. This binds the ingredients. Mixture will pull away from sides and stick when pressed between fingers. Enjoy now or cover and freeze for later. If you are feeling fancy you could make them into balls and roll in coconut. And if you don't already have these ingredients on hand, it's worth going to get them. I make these in small batches like this because of the size of my food processor. So, if I want a larger pan of them I simply repeat the process for a double batch. My mom, she always said that people raved about her food, and she attributed it to her secret ingredient. She made everything with love. I think that love really is the most important ingredient, as we seek to welcome people to our tables. However, dates may run a close second in the secret ingredients category. So remember to add a teaspoon of love to everything you do and let me know what you think of these little gems. Do you have a super easy amazing recipe? What tips do you have to help keep extending hospitality simple and fun! We’ve lived in this one quiet sub-division for over twelve years now. Many of the neighbors have been here a long time as well. Mostly we all wave a small cordial wave. We’ve gone a few times to the annual Homeowners Association meeting. Such as when the restaurant where the meeting was being held. Yet, if I were pressed to admit it, I don’t know many of my neighbors by name. I’ve purchased cookies and popcorn from some of their kiddos. A few have brought me literature from their church. One put his presidential candidate sticker on my shirt without my consent. He has a spunky little wife who seems to know much that goes on in the neighborhood. Does it count that I know the names of some of my neighbors pets? Not sure why it’s easy to remember names like Reggie, Murphy & Missy. And there are even a few others, people who were regulars at the little coffee shop where I worked part time years ago. Folks who I still remember what they drank. Seriously, how can I know that they ordered a “large, skinny, sugar-free hazelnut latte with no foam and extra whip,” but I do not know their first name? We all kind of keep to ourselves here, but would probably notice if strangers were backing up a U-Haul in someone’s absence. –Well, maybe. 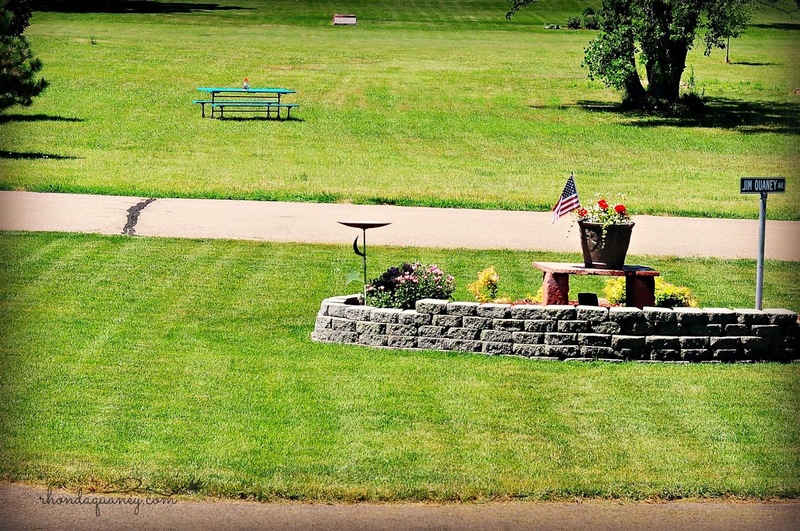 A few years ago my one neighbor decided to begin hosting the annual meeting in her back yard. Bless her. She has a wonderful enclosed porch, with windows that can be opened to allow the evening breeze to drift through. Having a neighbor open their home for others really changed the tone of the annual meetings. I probably should have been the one to think of that. 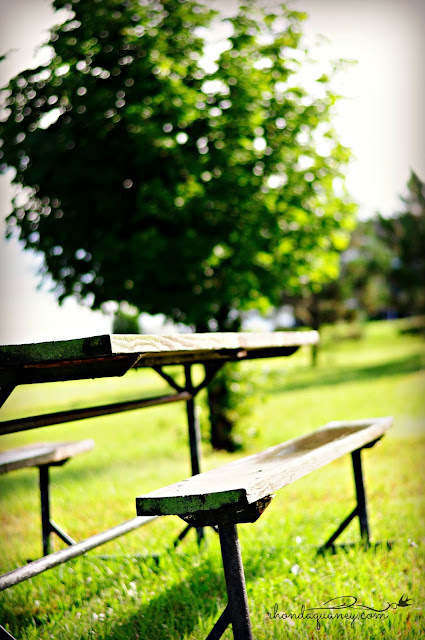 Last year, at the annual Homeowners Association meeting, the Spunky Little Lady, wanted to discuss the old rough wood table that sits on an empty lot which is set aside to be a park in our neighborhood. Before all those in attendance even made their way through the buffet line for the first time, she made a case that the table was too heavy, too old and "….no one uses the table anyway." My front picture window looks toward that little park, which is home to the old table and an aging cottonwood tree, but I had no real opinion about any of it. Others at the meeting surprisingly wanted to keep the picnic table and moved on to other important new business. Truth? I've never seen anyone sit at the table either. This spring I attended Jumping Tandem Retreat. One of the sessions I sat in on, was with Kristen Snell. She is so much of what I love. Her blog photo was taken in her fabulous kitchen. She is an author, a chef and a woman who exudes easy-going acceptance and hospitality. At the retreat, she made us feel like girl-friends and she shared how she had been sure life would have her living as a missionary in Africa. Instead she lived in a nice neighborhood in Austin Texas. She had a big dream of living in a community where neighbors knew and loved each other well, but it wasn’t happening. 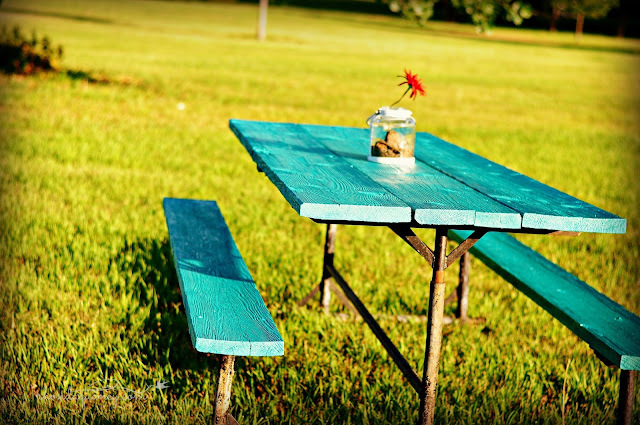 One day she purchased a wood picnic table and painted it her favorite color and placed it in her front yard. 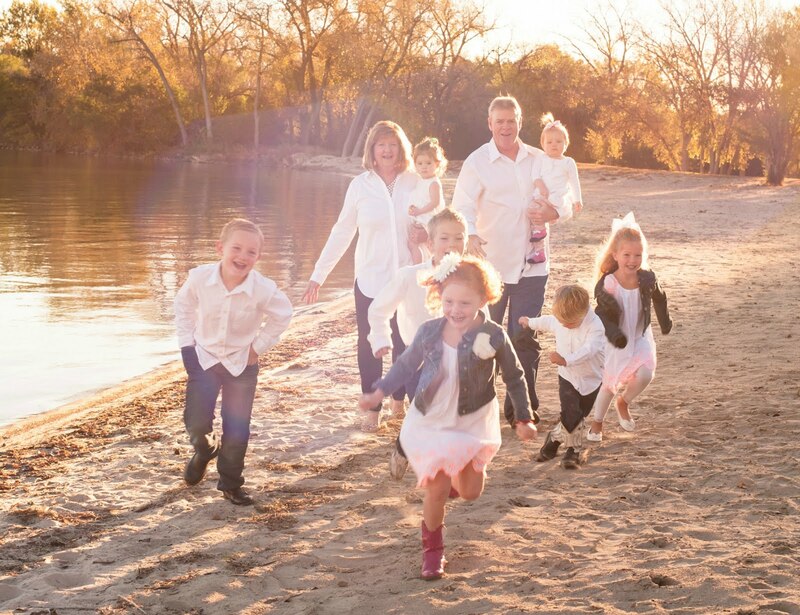 Just like God would do, her step of faith, her being available to her neighbors, has taken on a global community life of its own, called The Turquoise Table Community. When I heard her talk about the friendships that were happening around that table, a few places came to mind, where I too could paint a table and of course one of them was in the little park across the street. I’ve continued to drive by my neighbors many times…. waving that safe little wave. I remembered the Turquoise Table. I finally went and purchased some paint and last week after I was a mess from mowing our one acre lawn, in the 97 degrees heat, with earphones still pressed in, listening to music loud on my iPod, I grabbed the paint and a brush and walked over to the little park. It felt like something holy and brave and a little weird and crazy. Pouring paint in long thick lines to fill the weathered grooves, I prayed and made long sweeping strokes with the brush. Painting was my tiny step of faith. Less than fifteen minutes into my little project, completely swept up in the rhythm of music, painting and the pressing heat, I was startled by a tap on my shoulder. It was the Spunky Little Neighbor who wanted to get rid of the table a year ago. She wasted no time getting to the point of her mission. She began to list all the reasons she did not like the table and wanted to know why on earth I was bothering to paint it. She was interrupting my little sweaty moment of self-focused happiness. And then she looked me in the eyes and with age crackling in her voice she said, "What is your name?" Suddenly I was flooded with the realization that she wasn’t an unwelcome interruption, she was the very reason I was painting the table in the first place. I wanted this table to become a place where conversations could happen which would not normally happen. Conversations just like this one, where we exchanged names and earnest words and ideas. Maybe even one-sided conversation, where we simply listen to the heart of other. When I had the presence of mind to ask her how she was doing, I found out that she had not been feeling well at all. And here I lived less than a block from her front door, but had no idea of her real needs. I was overcome by God’s humor and God’s grace and God showing up in the first minutes of painting a table in hopes to get to know my neighbors better. 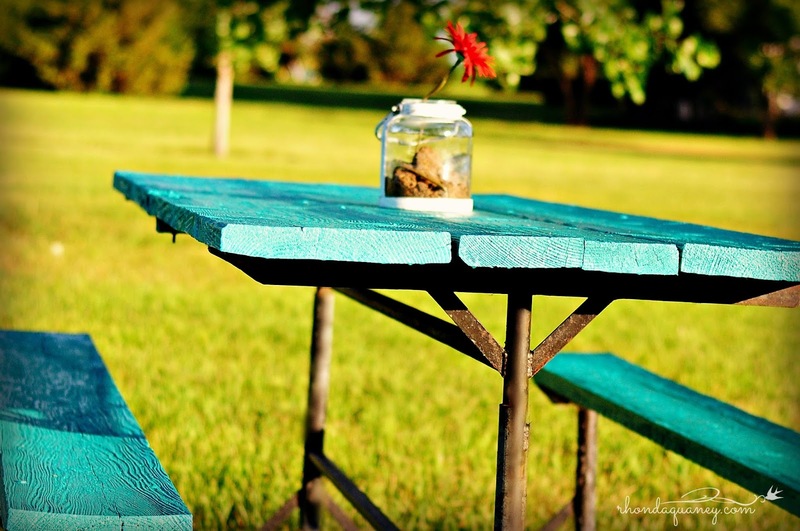 It was extremely interesting to me that this tightly wound little lady, the one who thought this old table served no purpose ––was the first one at the table. Maybe, –just maybe, the Lord can use a table in an empty lot to be a standing invitation to come just as you are. Perhaps this table, with an open-air ceiling will leave space to be present over perfect. In all the rush-rush and go-go of life, what if sitting at a table like this, is a form of washing another person’s feet, because it delivers us from staring at ourselves. Instead, I was gazing into the eyes of another person who needed to be seen and to be heard. Coming to a table speaks the message, that for just a few minutes we are going to press the pause button and ask how another person is really doing. This table life is actually heart-felt hospitality in the most pure sense. It's interesting that the Greek word for hospitality that is used in the New Testament is philoxenia which literally means “Love for Strangers“. 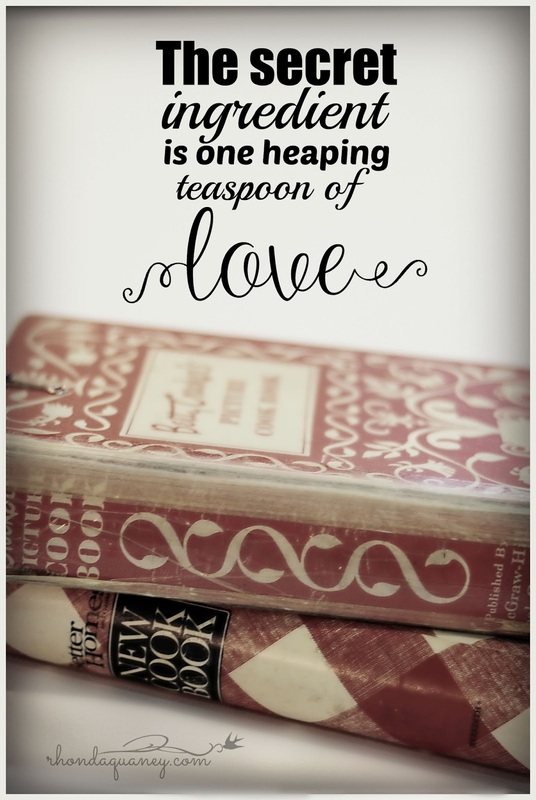 At the root of hospitality is love. Hospitality is not a meal served up with the perfect centerpiece and dessert. Hospitality is an attitude that is available to others. There is no doubt that my primary sphere of influence in my home. So it would seem logical that the neighborhood my home is located is most likely a place that friendships could be forged and kindness could be extended. I cannot do that if I don’t know my neighbors. It means moving past mowing the yard and waving at others who are mowing their yard. My prayer is for this turquoise table to serve as an altar for many conversations and much needed community. 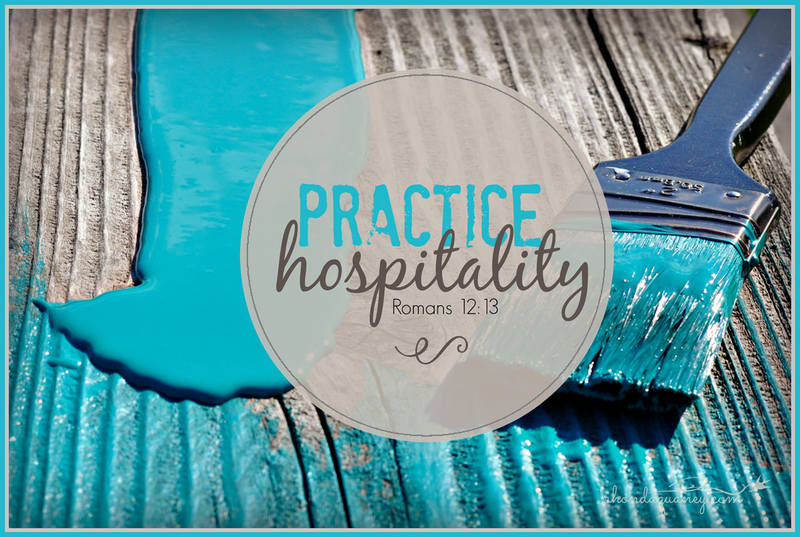 May it be a platform to practice hospitality. A place where strangers can become friends. How about you? Do you know your neighbors? I would love to hear about your table stories. Aging cottonwood trees draped their bare branches over the narrow country lane. The few limbs that held clusters of green, filtered the high noon sun into pieces of light and shadows that danced. The company I worked for at that time had been called out to this remote location, a place we had been driving for hours to find. We were hopeful our search had ended as we passed by the graveyard of old vehicles and machinery we had been told to look for. It was the kind of place encapsulated in time passed, with relics of rust and weathered wood. We were met by the large black dog, who we'd been warned, "...wasn't used to strangers." The old house, appeared to have once been white with green shutters, but now the wood was bare and the large picture window had a long crack. A woman appeared and called the dog away from the vehicle with a gruff voice, then signaled for us to follow her. She too looked as if she were caught in some time warp from something like Little House On The Prairie, only instead of an apron she wore a denim work shirt, soiled jeans and gloves. She seemed to be comfortable living in this place that knew little of hot and cold running water or forced air heat. I’ll admit, I stared at the deep wrinkles worn into her leather-like face. Her teeth, what there were of them, were straight and white and formed an occasional crooked smile. Sound echoed, as we walked on wood floors that were scuffed and no longer had a glossy finish. A couch sat in the living room with one cushion missing. She led us toward the kitchen and invited us to sit at one of the three mismatched chairs randomly gathered near a lone formica topped table which faced a bay window where her cat stretched out in the sun. She offered us some of the half-eaten tuna, still in the can, along with saltine crackers. Of course we stammered and made excuses, but thanked her for the offer. There was small talk and business talk. She would place a dab of tuna on a cracker and chattered while she ate. Our awkwardness faded as we were able to look past the outer layers of this woman's appearance and listened to pieces of her story. Her story included abuse and neglect from an alcoholic husband and how grateful she was to no longer live in fear. We left that day with two dozen eggs, which we had to help her gather, and a small carton of tiny but perfect strawberries from her garden. It was humbling and heart-wrenching and beautiful. It shook me up to meet her in all the best ways. Her simple act of hospitality has meant something to me all these years. I have thought of her many times. I've thought of how, with no apologies or excuses for her home or the food or the lack of presentation, she invited strangers to sit at her table. She was most likely hungry for conversation and community, because if we are honest, we all deeply crave that too. I've thought how her gift was more extravagant than any I've most likely ever given, since she gave out of her need and I only invite people to my table out of my places of excess. I’ve regretted not sitting longer. I've regretted never going back. I've wished I had been able to capture a picture of her. Not to grasp the sadness of how things appeared, but to seize a glimpse of her soul, so I could more vividly remember my time at her table. The outward appearance will never tell the story that rests just below the surface. In its most simple form, she showed me what happens when people sit for a few minutes at a table, listening, laughing, being. Without intending, her gesture of hospitality has left a lasting impact. One sparsely furnished home, with a table as the most prominent piece of furniture. Of all the things that she did or didn't have, she had found her table. Intertwined in my own life, the table has played a central role. Thankfully my mom made the table an important part of our family life. She also loved her neighbors well. Around our table people could relax. There was laughter and tears and sometimes food. What was important was the conversation. The connection. The allowing people to feel embraced and accepted. That woman in the old house without one fancy thing to her name? She extended uncommon grace and it was up to us to reach out and accept the gift. I've been thinking about how I need to be doing more life around a table. How I need to offer more simple invitations to come sit. Forget the fussy stuff and the inconvenience. I need to invite more people to my table. I need to know who my neighbors are. I am desperate to move past the veneer conversations and sit down to hear the heart of a person. I long to be that place which offers uncommon hospitality to refresh people like a cool glass of water on a scorching day. Don't we all want to be that person who embraces people right where they are in their story? Because that is how we as people can chase away the shadows and shine the light of Christ in the most basic way. To do this, we have to invite people to come. 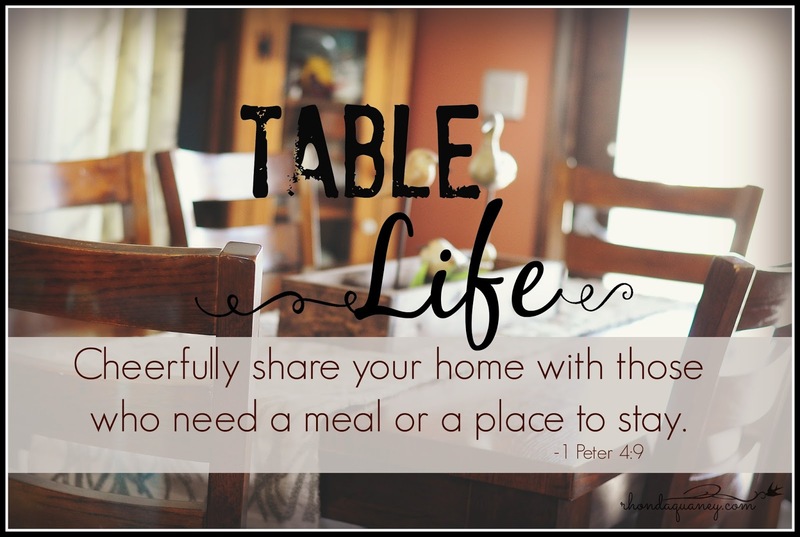 I'm going to be spending more time talking about table life here on my blog. It is something that is stirring up words in my soul. Thank you for joining me here in this space, which I consider a table of sorts. 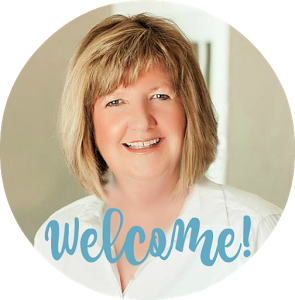 You are welcomed guests and I value you what's going on in each of your lives. Tell me, when was the last time you invited someone to your table? I don’t remember exactly when I became obsessed with July, the American flag and freedom, but it happened. 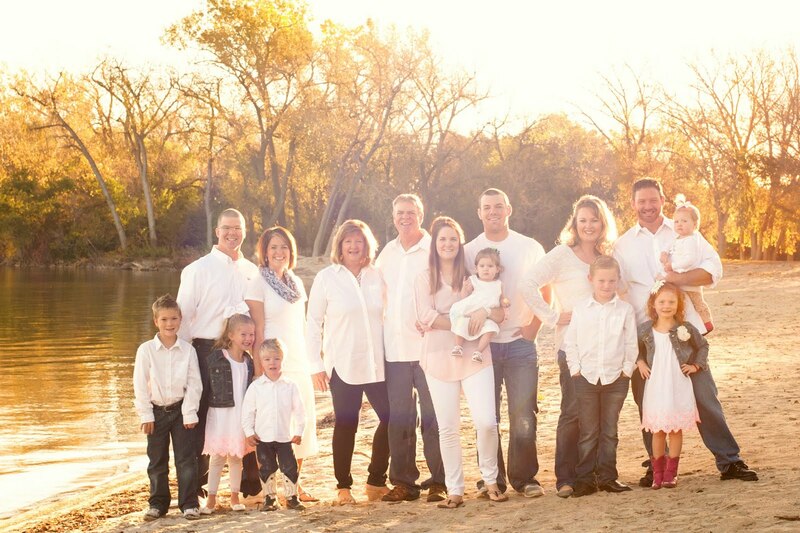 Growing up, my family celebrated every 4th of July at my grandparents’ small lake cabin. 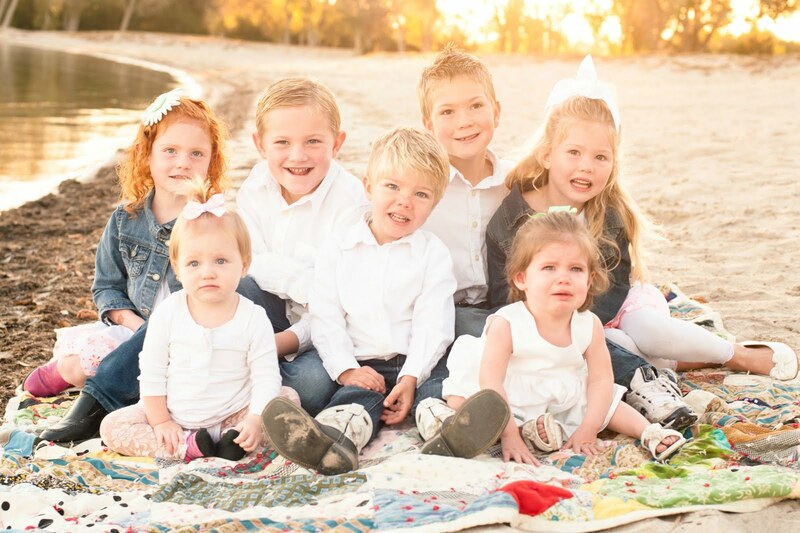 Somehow they managed to raise eight children (seven daughters) and lived to tell about it. Those summer gatherings were centered around tables which were placed end to end and filled with platters of fried chicken, large Pyrex bowls of various salads, and pans of desserts. Lots of desserts. The adults relaxed in lawn chairs while cousins carried over-sized black inner tubes down the gravel lane to the lake. There we drifted aimlessly in murky colored water without sunscreen or worries. Those kind of gatherings eventually gave way to new traditions. Many of the aunts and uncles are gone now and I honestly can’t recall the last time I actually cut up and fried a chicken. Maybe never. Though I do try my very best to make Aunt Pat’s potato salad, hot dogs and hamburgers on the grill are more of what you can find around here. In true American style we mow the yard, fly the flag and gather to watch fireworks light up the sky. Somewhere between those early carefree years and the here and now, I’ve learned about the price that was paid for the freedom I enjoy in this country and even more about what true freedom looks like. In life, tragic things happen, poor choices are made, lies are embraced, and all too often fear drives pain deep. It all steals the freedom that is really ours to have. Well, it definitely stole the freedom that was mine to have. I’ve had to fight hard to write freedom into my life story. 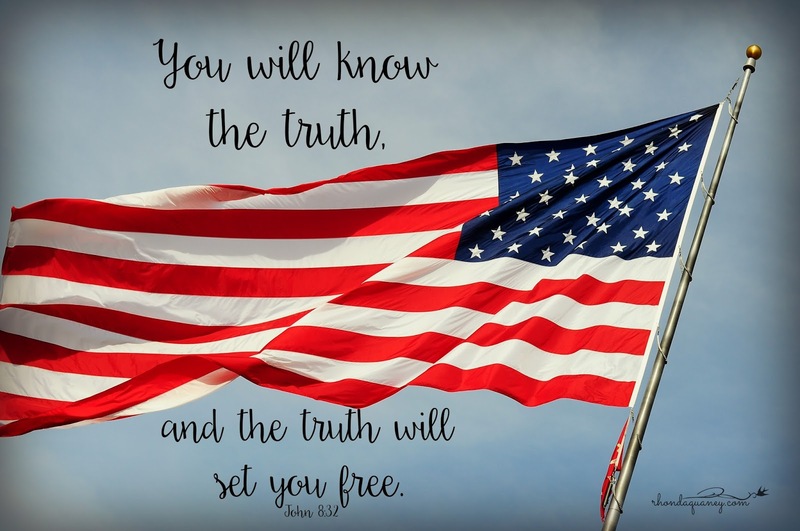 Yes, there are verses that say freedom is a current reality if we know Jesus. However, reading about freedom and actually walking in it have been two very different things for me. I’ve searched for freedom in many places and people. In the number on the scale, the work I do, the home I live in, the children, bank balance, vacations, and in who I spend my time with. All of those things can be good, but none of those things were capable of delivering me from the chains in my life. 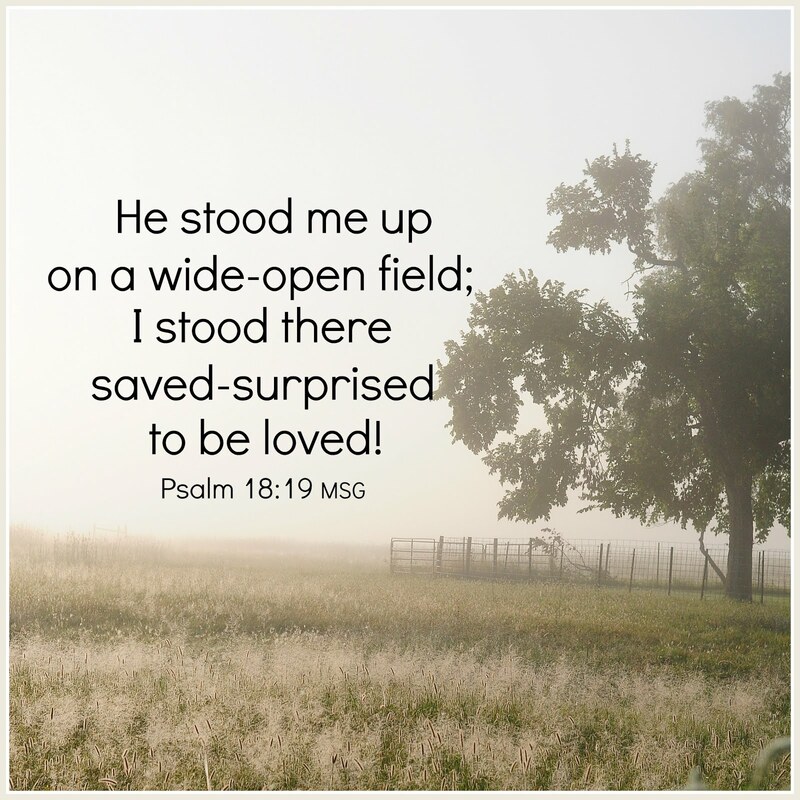 Understanding that my identity is in Christ – now that set me free. Grasping with my heart that God doesn't force me to love Him, because then it wouldn’t actually be love. Love cannot exist outside freedom. We can love God because we have a choice not to love Him. The good news? We have a choice. The bad news? We have a choice. We have the freedom to choose, indeed. But each choice carries an outcome. God loves us so much that He does not force Himself on us. We can choose to accept Him or choose to reject Him. Either way He loves us. However, one path is life and the other is destruction. God is in the business of setting people free. But freedom comes from knowing Him and making choices that bring life. I love living in America where I enjoy so many temporal freedoms that are not available in other countries. 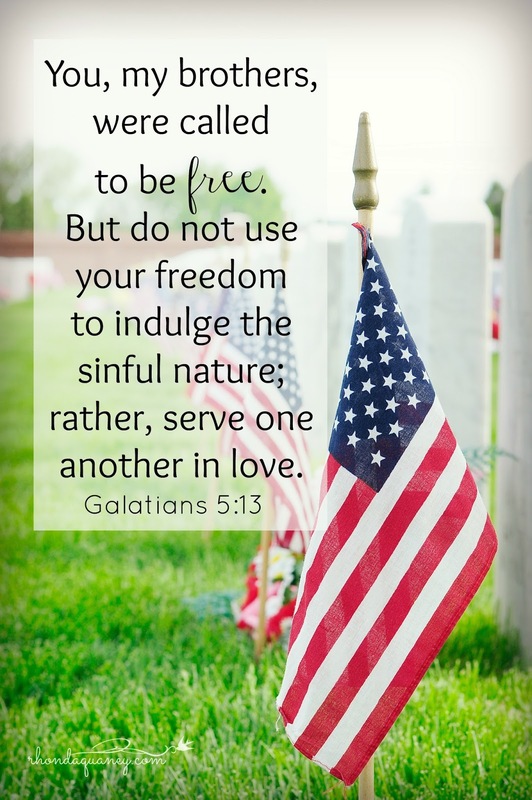 Freedoms that were secured by brave men and women who gave all they had to give. 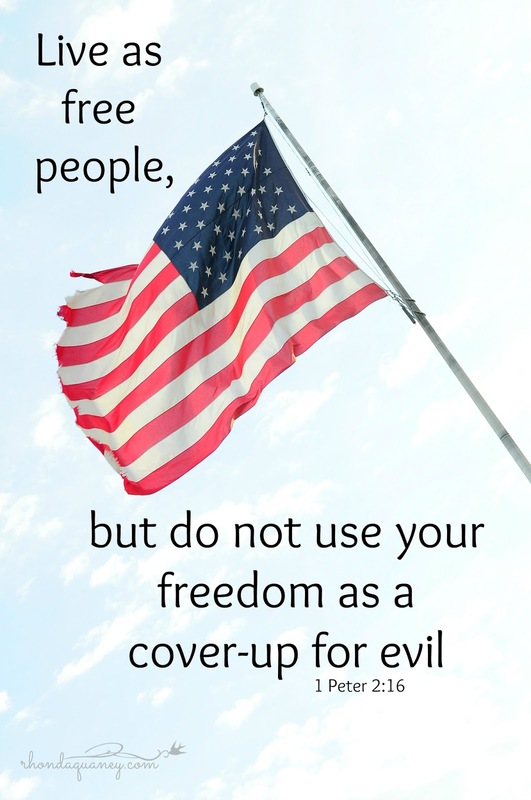 Freedoms that carry responsibilities to maintain them. But this world is passing away and we are all just passing through. When Christ died on the cross, He died for every sin. Past. Present. Future. 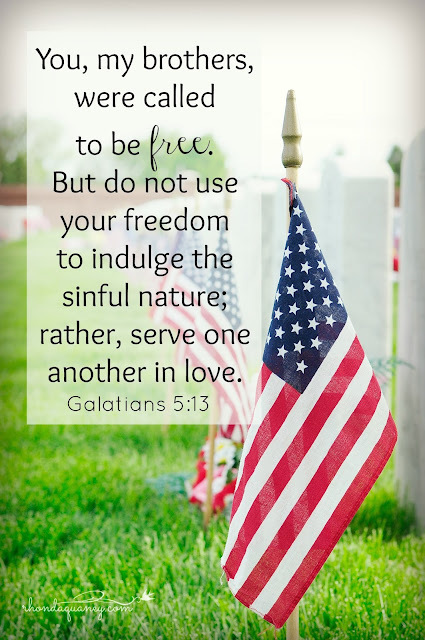 He made the way for mankind to have eternal freedom. But friends, He will never force us to accept that gift or to embrace that freedom. 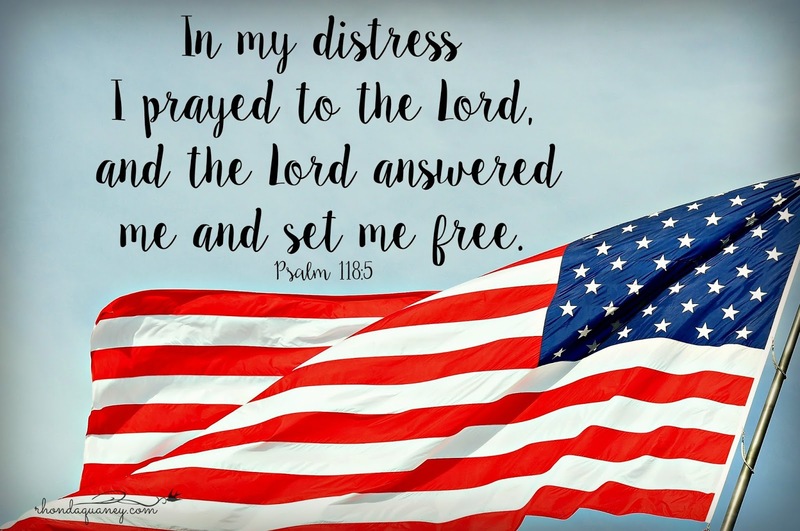 Celebrating the 4th of July and the signing of the Declaration of Independence, I'm reminded that I need to declare my dependence on Him. Looking to Him, trusting Him, and finding security in Him. 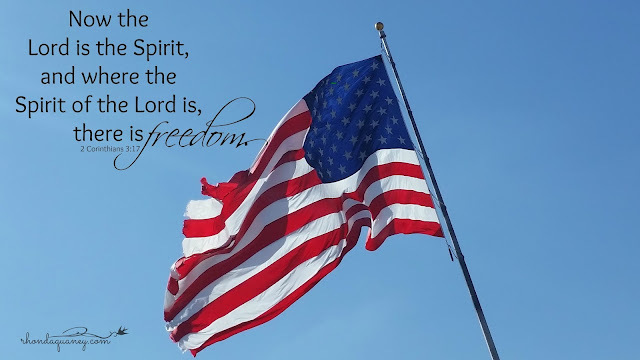 That is where true, lasting, unshakable, freedom lies. Galatians 5:13 really does make it kind of simple. 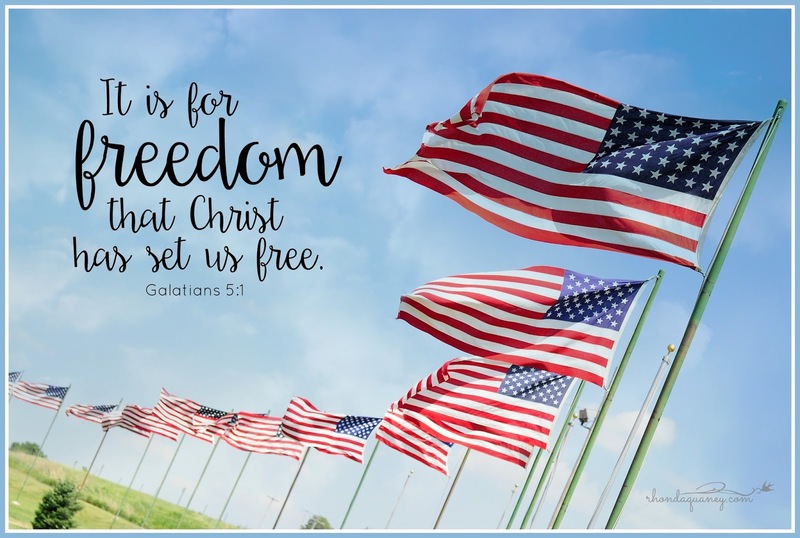 We are called to be free. May we each wave our freedom like a flag and us it to serve one another in love.